Wow! Your little one is quickly moving onto new foods, more meals and greater independence. By this stage/time, she has now been introduced to a wider variety of foods but please remember the 4 day wait rule. There are still a variety of foods that your baby has not tried and adverse reactions are still possible. At this point, you may have been gradually increasing the amount of solids your baby eats as baby gets older and becomes accustomed to eating solid foods. Offer your baby 1 or 2 food cubes of each item when your baby indicates she is ready for more. You may also think about introducing finger foods and more textured “table” foods at this age range. It is important to note that even at this stage, not all babies between the age of 8-12 months old will be eating the same amounts nor will they be eating the same foods. Again, due to the differing ages that babies start solid foods, some 10 month old babies still may not have had dairy products for example. 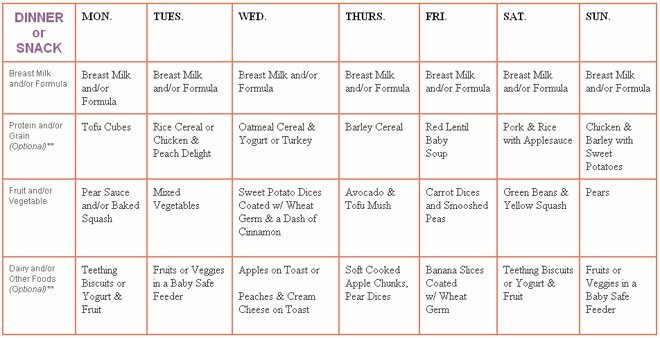 There are many infants that do not start solids until 8 months of age and thus, this particular menu sample would not be appropriate. Following any chart or offered schedule may not be suitable for your baby. Our menu sample is for example and idea purposes. The menus are geared to give you ideas of what types of food you could serve at different meal times to get a good balance of nutrients and variety. These menu suggestions assume that you have introduced the stated foods and that you have waited the proper time period to detect an allergic reaction.Do NOT feel as though your baby should be eating solid foods according to any schedule. Your baby will eat as much solid foods as your baby needs – trust your baby’s cues. When you look at our sample menus, don’t think about serving adult sized portions. Your little one surely could not eat 1 cup of oatmeal with ½ of a banana mashed into it along with ½ cup of yogurt for example. However, your little one might be able to eat ¼ cup of oatmeal with a wee bit of banana mashed in with a small drizzle of yogurt to stir in. We do not note amounts of foods because, as we say, all babies are different and will be eating differing amounts of foods. What is a Food Cube serving? A “food cube” is an ice cube sized serving. Each ice cube is equal to approximately 1 ounce. There are approximately 2 tablespoons in an ounce. Read the page How Much Should My Baby Be Eating to learn why your baby may eat more or less than others. All babies are different and your baby may eat more or less than what is shown on these example charts. Is My Baby Ready for Solid Foods? How Much Should My Baby Eat?